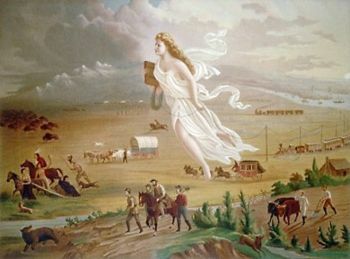 A stunning illustration tieing American westward expansion with destiny and progress. It is somewhat trite to suggest that America was founded on the idea of progress and that it remains both an amorphous concept and one central to American national identity. In the 1830s an astute French interpreter of United States society, Alexis de Toqueville, observed that Americans had a “lively faith in human perfectibility,” and that as a society they believed they were “a body progressing” rather than one that either declined or remained stable. If anything de Toqueville understated this belief, for the concept of America as a Utopia in process has permeated the national ideology since before the birth of the Republic. From Thomas Jefferson’s stirring statement in the Declaration of Independence that people must work to ensure that all receive their unalienable rights of “Life, Liberty and the pursuit of Happiness,” to the refrain of Crosby, Stills, Nash, and Young’s lyrical “We can change the world, rearrange the world. It’s dying—to get better,” progress has been a major subtext of every aspect of American life. The idea of progress has typically advanced three claims: 1. There are no fundamental limits on the human capacity to grow, however growth is defined; 2. Advancements in science and technology foster improvements in the moral and political character of humanity; and, 3. There is an innate directionality in human society, rooted in societal, psychological, or biological mechanisms, that drives civilization toward advancement. American believers in progress quickly embraced space travel, viewing it as a vindication of the doctrine’s original claims about the near-inevitability of human improvement. With space travel understood in this fashion, the fate of the space program took on a far greater meaning than developments in other areas of technological endeavor, as it became symbolic of the entire directionality of human civilization. Although progress had been present earlier in the works of such space advocates as the Russian Konstantin S. Tsiolkovsky, the American Robert H. Goddard, and the German Wernher von Braun, after the conclusion of Project Apollo in the 1970s space enthusiasts believed they were on the verge of a new golden age in which anything could be accomplished. Apollo raised the hopes of those dreaming of great human progress in space. Its transcendental qualities were not lost on those who believed that the human race could eventually attain this end. 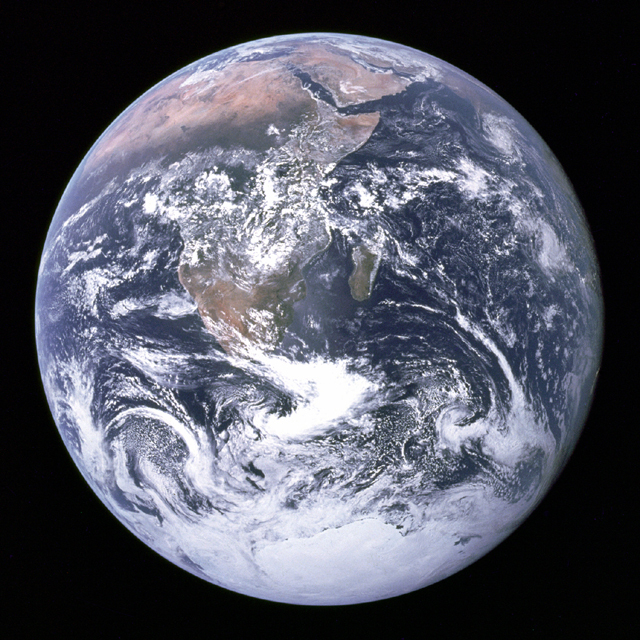 The whole Earth disk taken during the Apollo 17 lunar mission in December 1972. Space advocates also foresaw a new era of peace and mutual understanding arising in response to Apollo. Carl Sagan described “the unexpected final gift of Apollo” was “the inescapable recognition of the unity and fragility of the Earth.” He noted that “I’m struck again by the irony that spaceflight—conceived in the cauldron of nationalist rivalries and hatreds—brings with it a stunning transnational vision. You spend even a little time contemplating the Earth from orbit and the most deeply ingrained nationalisms begin to erode. They seem the squabbles of mites on a plum.” Peaceful expansion beyond Earth, they thought, would lead to a golden age of peace and prosperity on Earth as national rivalries would be replaced with collective action toward a great positive goal. Forward-looking and aimed toward human perfections, Apollo signaled great opportunities for the future. This sense of progress also embraces another national myth, that of the innocent nation. Completely without justification, the United States has come to believe that whatever it does is just and righteous and representative of progress. This may be seen in virtually all periods of American history but it is especially present in the great struggles of the twentieth century. World Wars I and II especially led Americans to believe they were fighting for the survival of all that was good against forces of evil. But it also may be seen in the cold war against the Soviet Union, and in the aftermath of 9/11 in the global war on terrorism. So too with Apollo as a representation of progress for most Americans. This entry was posted in Apollo, History, Lunar Exploration, Personal, Politics, Space, Uncategorized and tagged 1960s, American exceptionalism, Apollo, cold war, Department of Defense, History, Moon, Moon race, NASA, U.S. Civil Space. Bookmark the permalink. Of much more significance than Apollo, is the progress due to the development of communications satellites starting in the 1960s. While our conquest of the moon has not led to any other great leaps forward, the steady technological progress with our satellites since then has led us towards political and social interactions that we couldn’t have dreamed of in those early days of our space program. Are all these interactions good or not–I don’t have an answer to that question. All I know is that we’re in a different world today that we were 60 years ago. Let’s be honest. The purpose of Apollo, which it admirably served at great national expense, was to stick it to the Soviets. That’s what it was ALL about. At root, it had nothing to do with exploration, and even the Moon was somewhat a peripheral goal. Those grandiose and outwardly admirable sorta-goals were part of the real national myth. Apollo was a magnificent achievement. Yes, exploration happened, and yes, the Moon was conquered. But that wasn’t what Apollo was for. Yes, Apollo signified progress, but it was progress in promoting national exceptionalism. That’s why we haven’t come close to doing a follow-up grandiose and outwardly admirable goal. Because we don’t need to stick it to anyone any more. Progress hasn’t stopped. But the need to assert national exceptionalism of that order simply doesn’t exist anymore. Now, there were many ways we could have asserted national exceptionalism and stuck it to the Soviets, but the choice of Apollo to do it was profound political wisdom. Why? Because the mythology it generated was so compelling. So true. I’ll talk about that in Friday’s blog post.